In The Summer Games, Norway Rallies Around Its Women's Handball Team : The Torch Norway isn't renowned for its prowess in summer sports. One exception: women's handball. The sport is huge in Norway. Norway's Veronica Kristiansen is challenged by Sweden's Angelica Wallen (left) as she tries to score during the women's quarterfinal handball match between Norway and Sweden on Tuesday. It's a super-fast, action-packed game. Think of it as basketball without the hoop, indoor soccer without the feet, or water polo without the water. The Norwegian women have been building a handball dynasty. They won gold medals at the last two Olympics, and they're hoping for a three-peat here in Rio. In fact, they're Norway's best hope for a gold medal. So far, Norway has won just three medals at these Olympics, all three of them bronze, in rowing and wrestling. Winter sports, of course, are right in Norway's wheelhouse. Summer sports? Not so much. Each team has six players on the court, plus a goalie. The handball is bigger than a softball, smaller than a volleyball. A player can only hold onto the ball for three seconds before dribbling, passing or shooting. And the goals come fast and furious. "Oh, we get like between 20 and 30 goals" per game, says Linn-Kristin Riegelhuth Koren, known as "Linka" to fans back home. She plays right wing for Team Norway. "I love it!" she says, grinning. "I'm lucky. I became a mom in December and I'm fighting my way back to the national team. So it's an honor to play for Norway." At the Olympic athletes village, an excited gaggle of Norwegian TV and radio reporters clusters around the gold medal hopefuls, angling for interviews. Never underestimate the star power of Norwegian handball. "The girls are heroes back in Norway!" says the handball team physiotherapist, Trond Sjobakk. The Norwegian men's team didn't even qualify for the Olympics, but the women? Sjobakk says everyone back home knows the players on a first-name basis: "Nora, Stine, Veronica, Emilie ..."
They are, I figure, the Usain Bolts of Norway. So, I ask Koren, what is the U.S. missing by ignoring handball? "You're missing a sport that gives a lot of excitement to many people. It's a good sport for people who like to watch and be cheered up, and see people be able to have fun together!" Outside the Olympic arena where the Norwegian women have cruised to the semifinals, I find mother-and-daughter fans Iris and Iselin Froybu. 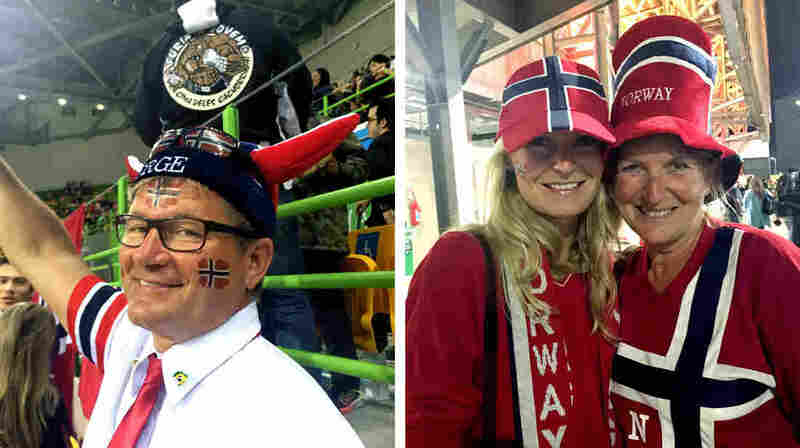 They're hard to miss in their patriotic regalia: they're decked out in hats, shirts and scarves all patterned with the Norwegian red, blue and white flag. They've even painted Norwegian flags on their cheeks. Handball is a way of life back home, the mom, Iris, tells me. Like many Norwegians, she grew up playing the game. "You can play it from the age of 5 or 6," she says, "and it's very social. You can play it all over the country. There are arenas everywhere." Today, when the Norwegian women take on Russia in the semifinals, you can be sure their countrymen and -women will be avidly following the action, leap by leap and goal by goal. The gold medal match will be played on Saturday. Editor's Note: Russia upset Norway, 38-37, on Thursday.